Buried on the depth chart and unlikely to get a significant opportunity to play for the Florida Gators this season, redshirt sophomore guard Dillon Graham has decided to transfer from the program at the conclusion of the fall semester. Graham, a 6-foot-4, 185-pound guard who saw a total of 92 minutes of action in just 25 games in three seasons, has neither decided on a transfer destination nor what level of basketball he wishes to compete in following his time with the Gators. Graham played in 23 games as a freshman but was sidelined for the entire 2013-14 campaign after undergoing surgery to repair bone spurs in both of his hips. He worked hard at rehabilitation during the season and in the offseason but would have been Florida’s fifth backcourt option this year. With none of those players being seniors, freshman Brandone Francis expected to become eligible in 2015-16, junior DeVon Walker set to recover from a torn ACL and the Gators ready to introduce a new class of players, Graham obviously realized that his chances of playing Florida basketball were slim. “I have a high level of respect for him. He’s an unbelievable kid. Certainly the last few weeks, I could see him a little bit unhappy. And I don’t think it had anything to do with the players or the coaches or the University of Florida. I think it got to the place, like a lot of guys do where they start to grow and become a young man, is this really what I want, is this really what I want to do? And I think for him, he worked hard to get over his hip surgery, and I think he just got to a place where he just felt like his heart wasn’t really into it like it needed to be,” Donovan said on Sunday. Donovan said Graham will be allowed to remain around the team for the remainder of the semester. 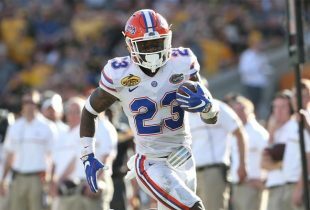 Though he will not practice with the Gators, the training facility and academic center will be open to him until he leaves. Donovan ultimately was not surprised with Graham’s decision, noting that the player showed signs of disinterest and unrest over the last few weeks. In fact, he notes that Graham was much more worried about how Donovan and Graham’s Florida teammates would react to him leaving the team as it was getting started with the 2014-15 campaign. “He’s such a good kid. He said, ‘Coach, are you upset or are you mad at me?’ I’m like, ‘No, no, I understand.’ … I would feel far worse as a coach if he went through four years and was saying, ‘In my four years, I was really, really just kind of unhappy. I wish I would have done something different.’ He has a chance to do what he wants to do now and make it work out for how he see it work out, finish up school. He’s on his way moving towards a degree and hopefully he can find the happiness he’s looking for,” Donovan explained. As a result of Graham’s departure, a much-needed scholarship has opened for the Gators in 2015. 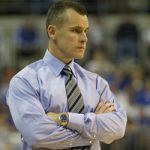 Florida now needs just one more to open up – in addition to the expected departures of fifth-year senior center Jon Horford and sophomore forward Chris Walker – in order to sign its entire 2015 recruiting class. Next for Chris Walker: NBA or Donovan process?